No level of secondhand smoke (SHS) exposure is safe. SHS exposure occurs when nonsmokers breathe in smoke exhaled by smokers or from burning tobacco products. It kills more than 400 infants and 41,000 adult nonsmokers* every year. 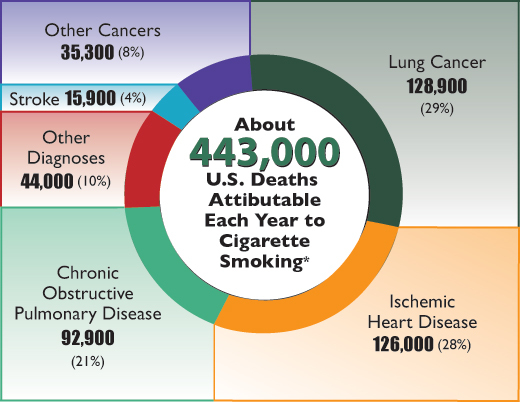 Exposure to SHS among US nonsmokers has declined, but progress has not been the same for everyone. SHS exposure is more common among children ages 3 to 11 years, blacks, people living below the poverty level, and those who rent housing. Indoor areas of all public places such as restaurants, bars, casinos, and other private worksites. Multiunit housing such as apartments, condominiums, and government funded housing.